A Pump It Up For Platelets! event is so much more than just a fundraiser - it's a life-changing experience! It gives community members, family, and friends a chance to celebrate the Heart of an ITP Warrior, remember loved ones lost, and fight back against this debilitating disease. Every individual who participates in a local Pump It Up For Platelets! event joins others as part of the global movement to raise awareness for ITP. There are many reasons to organize or participate in a local event. You can experience comfort, support, and share stories with others who deal with the frustrations of ITP or who have lost a loved one to the disease. You will celebrate with individuals who are passionate about spreading awareness, so that one day, ITP will be as well publicized, researched, and understood as cancer. It's a day to gather together with friends, family, and colleagues to laugh or cry, and create lasting memories. 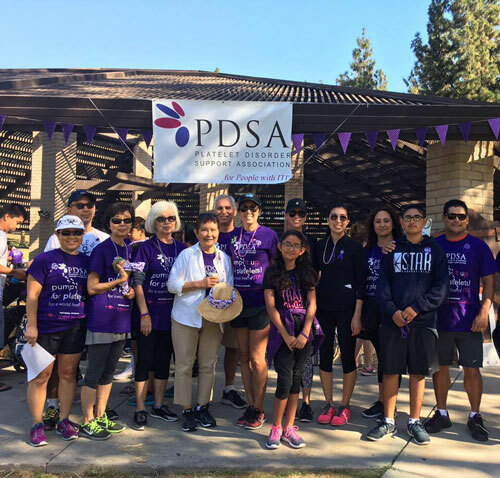 Regardless of why you decide to take part in Pump It Up For Platelets!, one thing is clear: With each step, you are helping PDSA help those affected by ITP. With your help, PDSA can continue to expand our reach with the most comprehensive information, member services, awareness, and research. Each person who shares in this experience can take pride in knowing that they are working to create a world where ITP will no longer be an unknown disease or negatively affect another year of anyone's life.